At Lamform, we offer a wide range of laminated worktops which are all displayed in our showroom. 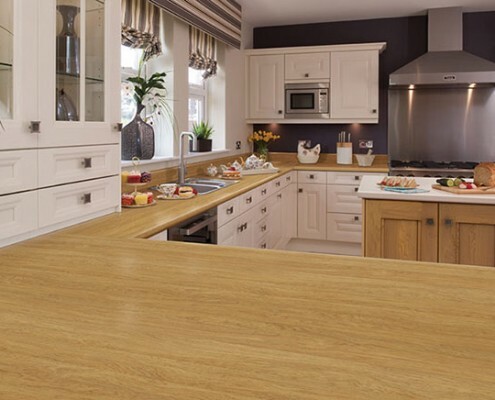 There are over 200 different colours and designs to choose from.We can supply worktops either 38mm (40mm) or 28mm (30mm) thick and can supply the 38mm tops as long as 4.1m long. All our worktops have a radius front edge of 12 mm, 6mm or 3mm depending on range and design. These all wrap around underneath and have a seal to protect against moisture and steam. They all carry a manufacturer’s guarantee. All worktops are available either cut to size or in standard blanks for your fitter to cut on site. We are able to make some bespoke worktops if the size you require is not one of the standard sizes. 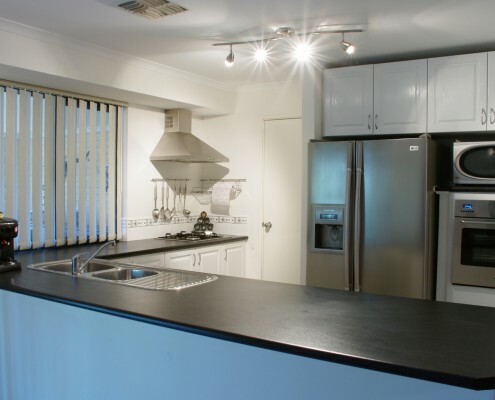 For more information on any made to order worktops, please contact us and we will be happy to assist you. We offer a take away sample service to assist you in your choice of colour or design. Omega has introduced metallic laminate designs into their range. These have a high definition terrazzo print delicately flecked with pearlescent particles and topped off with a lustrous high gloss finish – a much more affordable way to get that polished stone look. These are available in black, chocolate, cream, grey, red and white. Exotic wood grain designs have also been added to many of the ranges. Lamform can offer some really exotic wood grained worktops which reinterpret nature’s finest species, giving you a contemporary style. Tops such as olivewood, figured wenge, stripewood, mocha bamboo, plum butcherblock and walnut butcherblock offer a stunning visual appearance guaranteed to add grace to any kitchen design.